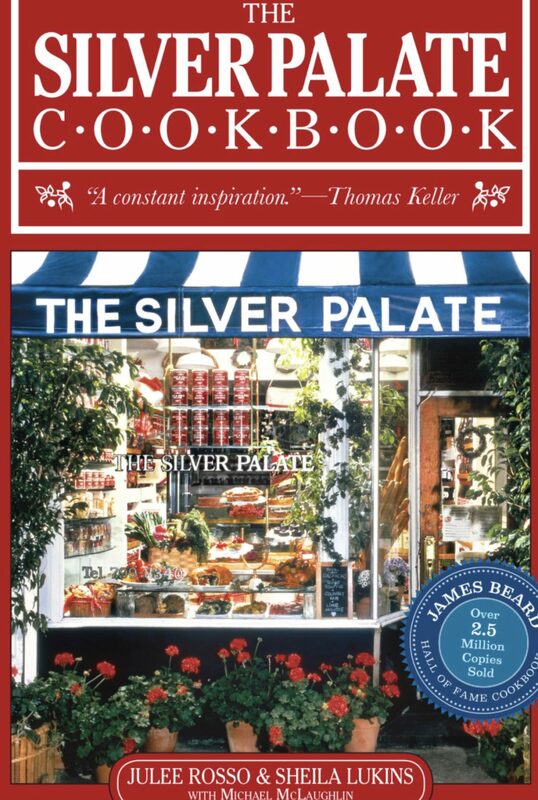 The Silver Palate Cookbook by Sheila Lukins and Julee Rosso is a classic and essential cookbook for any home chef. Seriously, if you don’t own it, buy it; you won’t regret it. First published in 1982, The Silver Palate Cookbook was an instant success. 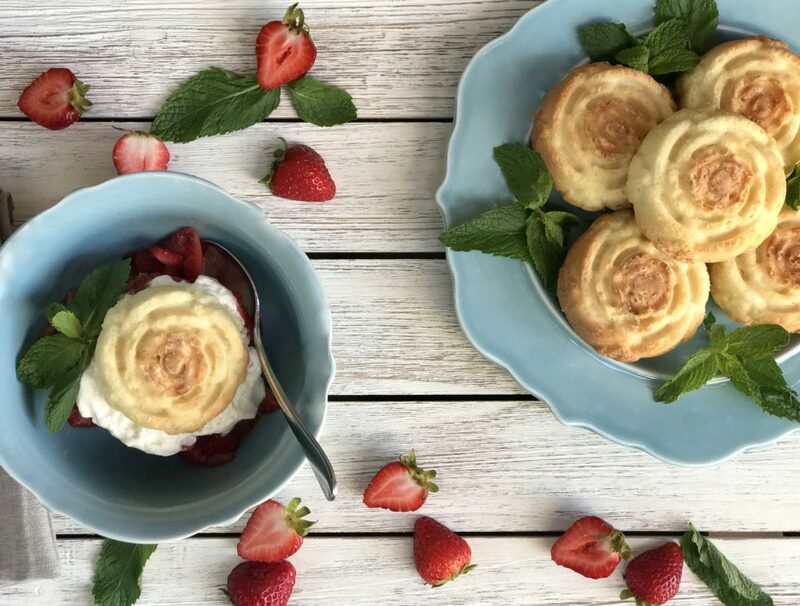 Based off of their incredibly successful upscale food store in New York City, Lukins and Rosso’s cookbook featured stylish yet easy recipes ranging from hors d’oeuvres to sweets. One reviewer noted that it “reflected and helped cement America’s burgeoning interest in quality cooking”. 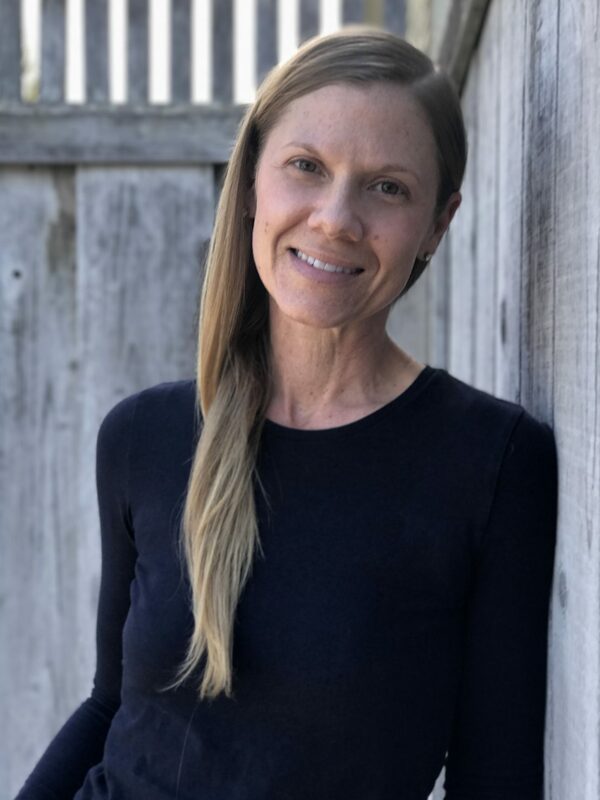 Lukins and Rosso helped introduce the typical home cook to new-to-the-market gourmet ingredients, which were just beginning to appear in some upscale stores. Lukins and Rosso successfully introduced Spanish, Mediterranean, and Asian flavors at a time when everyone was obsessed with French cooking techniques. These women were pioneers and their work has had lasting impressions on the culinary world. Very sadly, Sheila Lukins passed away in 2009, at the young age of 66, after her battle with brain cancer. The eight year anniversary of her death was yesterday. Her passing was a tremendous loss to the culinary world; but she had a groundbreaking presence in the cooking world. I was fortunate to have met Sheila Lukins, through her daughter who’s also childhood friend. When I met Lukins, it was many years before I became a chef. But I knew exactly who she was and I admired her. Some things never change. This Bishop’s Cake, a butter pound cake from The Silver Palate Cookbook, is an absolutely perfect pound cake. I don’t know the history of the name, but the Bishop Cake is a straightforward, classic pound cake recipe with nothing fancy or tricky about it. It is rich, flavorful and 100% reliable. Note, I adapted the instructions only slightly, otherwise this is the original recipe. Typically made in a bundt pan, I made it here using an individual rose-shaped silicone baking pan as an alternative. 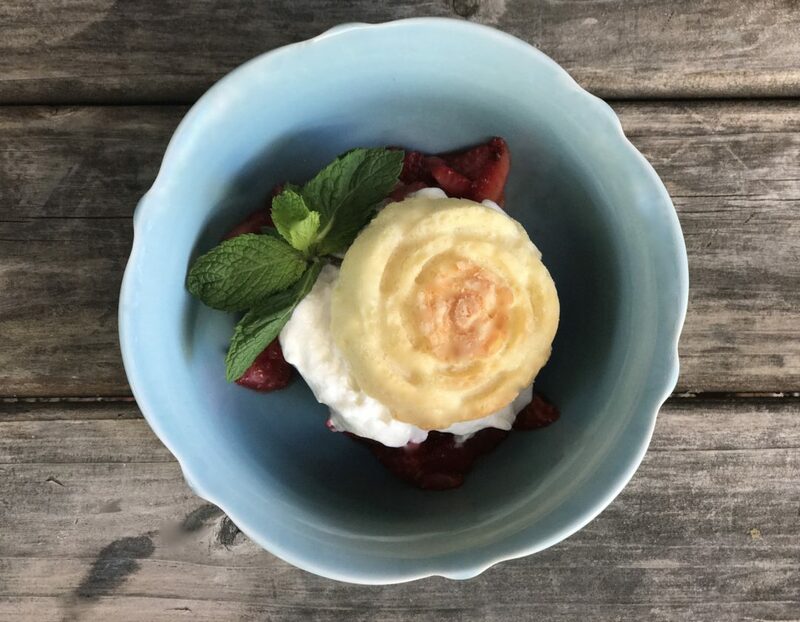 Served with macerated fresh strawberries, and homemade fresh whipped cream, this is a delicious and easy dessert for Labor Day or any other day you feel like whipping it up. Step 1 Preheat oven to 350 degrees F. Butter and flour a 10-inch bundt pan. Step 2 Using an electric mixer, cream together the butter and sugar gradually and beat until fluffy. Step 3 Add flour to batter and mix on low speed just to blend. Step 4 Add lemon juice and vanilla and mix just to blend. Add eggs one at a time, beating on medium speed for about one minute after each addition and scraping the bowl down as needed. Step 5 Pour the batter into the pan and smooth the top. 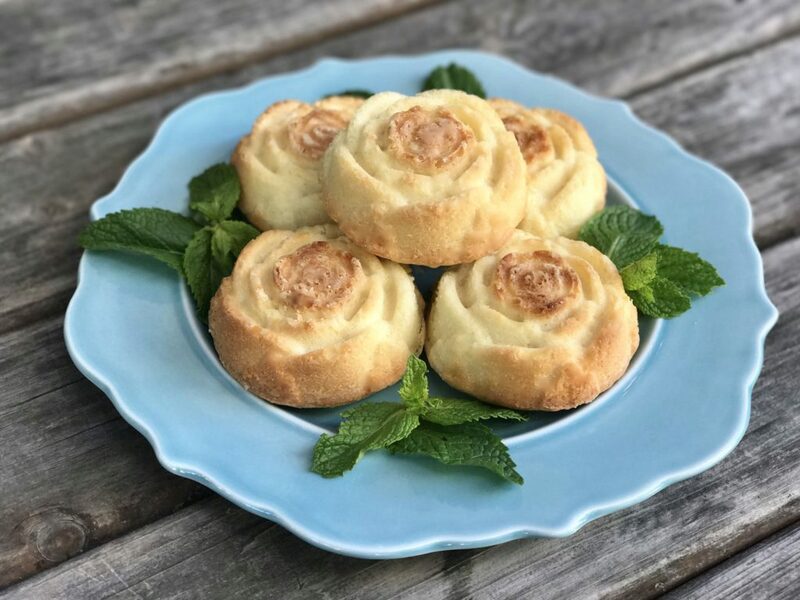 The original recipe calls for baking about 1 hour and 15 minutes but mine is always done closer to an hour so start checking at about 50 minutes and bake as long as you need to. Also if you see that it’s getting too dark, cover loosely with a piece of aluminum foil at around 50 minutes. Cake is done when a tester inserted into the center comes out clean. Step 6 Cool in pan on rack for 10-15 minutes and then remove from pan and cool completely on rack. Step 1 Place the sliced batteries in a small mixing bowl. Add the sugar and mix well to incorporate. Step 2 Add the vanilla extract and mix well. Set aside for about 15 minutes so the juices come out. Step 3 Once the berries have been allowed to sit, use a wooden spoon to partially mash some of the berries, but be careful not to mash them all. Step 1 Place the heavy cream in the bowl of a kitchen mixer such as a KitchenAid fitted with a whisk attachment. Step 2 Whip the cream on high just until the cream reaches stiff peaks. Reduce the speed to low and stir in the powdered sugar. Step 3 Adjust the sweetness level as needed.